In the competitive world of emailing, emails often make or break the trust of a consumer. Newsletters can be used to draw in new customers, build your company’s reputation, and generate repeat business. It is crucial that companies understand that each email sent out must be of value to the customer. First things first, don’t make email signups mandatory in your checkout process. Not only does this push a forced relationship on your customers, it often wastes your company’s time trying to target someone who just isn’t interested. 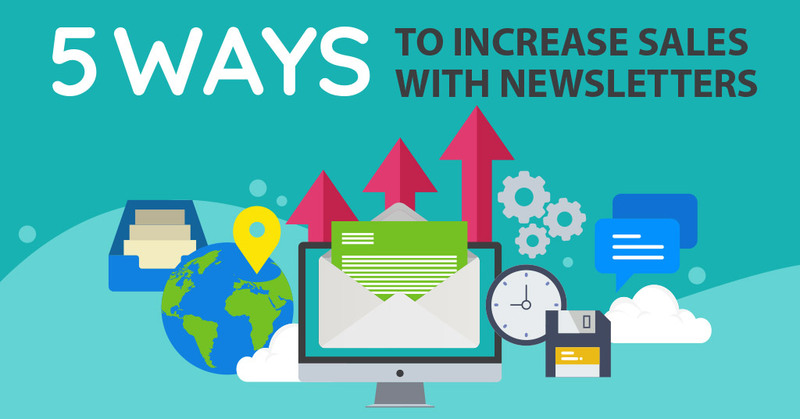 Subscribers who are actually interested in your company’s monthly newsletters will lead to conversion much faster. Also on that note, make the option to unsubscribe easy. Or at least offer a way to edit email preferences. While you may see a drop in subscribers, your long term subscribers that stick around will trust you. They know they can rely on you to not spam their inbox, but to market to them more efficiently. And most importantly, this is a violation of the newly implemented GDPR. Whether it’s a welcome discount or a toolkit they can download, there must be an immediate incentive to keep potential customers subscribing to your newsletter. Additionally, sending thank you discounts to new users can lead to a repeat sale. This is also a good reward for existing customers that leave reviews, or purchases a new product off your site. Who is your audience? Customers? Or ongoing clients? What kind of value do people want from you? Do they want latest industry news or the company’s upcoming events? Will your newsletters be strictly professional? Or more casual? How will you balance words and pictures? Are emojis, slang, or GIFs acceptable? Anyone can offer discounts, but brand equity offers value that separates you from the rest. 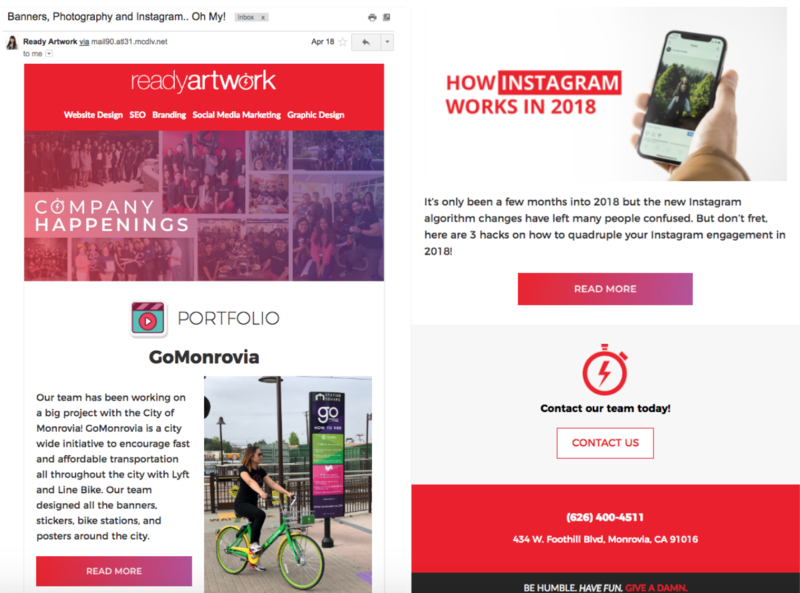 Since Ready Artwork is a service-based organization, most of subscribers are existing customers. Several are small business owners that seek value in ideas to expand their company. Our newsletters contain company news and updates, such as our GoMonrovia project. We also share industry-related blog posts with social media and Magento ecommerce tips. Sometimes we share quality content such as free downloadable social media calendars. Starting with one newsletter a month can be challenging. There’s so much information you want your new followers to know and new deals to offer them. But be patient. Your company is already competing with personal emails. Your email subscribers will unsubscribe if you spend every day sending out irrelevant promotions. Over time, you’ll be able to track who opens your emails and if they follow the calls-to-action you’ve placed. From there, you can separate your subscribers into different segments based on their interest. You can adjust your email marketing campaign from there. You’ll have someone who opens almost every email you send and is also a consistent, repeat shopper on your site. In this case, you can increase the number of emails sent per week. This can alert them on sales, company info, and update them with your newest products. You might also have someone who every so often opens your emails but never converts to a sale. In this case, you can use A/B Testing to optimize your newsletters to see which emails motivate them. Certain subject lines, content, and deals can change passive spectators into active supporters. One of the fastest ways to increase sales is to send customized time-sensitive discounts and flash sales. Flash sales can also be effective in pushing those on the edge to make an impulse buy. Flash sales often generate a 35% lift in purchase numbers, with 3-hour flash sales doing the best. Flash sales can be helpful in unloading excess inventory and meeting sales goals. But it can also increase customer loyalty and allow shoppers to check out non-sale items. 56% of flash sale emails have higher click-to-open rates compared to normal emails. Flash sales can either be a percentage discount off, a set dollar amount off, or a free item with purchase. If you’re advertising a deal on Facebook, make sure that your emails remind customers of that. Customers that saw coordinated ads on their emails and Facebook were 22% more likely to make a purchase, compared to seeing an email ad alone. Cross-promotional ads can also help users come back to their abandoned cart items. So do ads that follow users and send out low stock alerts on items that have been browsed before. Building a following for your company through newsletters is often a challenging task. It takes time and effort to notice results. Hopefully these 5 tips can help you turn product visitors into repeat customers! If you’re looking to start your own newsletters, or looking for a way to increase sales before the holiday season, contact us below or give us a call at 626.400.4511!